Enna is at first puzzled when she notices the changes in her brother Leifer. Then she begins to worry. It would appear that Leifer has learned to speak the language of fire just as Enna’s friend Isi has learned to speak the language of the wind. The problem with fire is that it can be so dangerous and acquiring its power has changed Leifer. He has become unpredictable and when he burns Enna in anger, she fears for him and for herself. Enna decides to go to the capital to consult with Isi who is now the princess of Bayern. She and Isi wonder if there is some way to help Leifer learn how to control the fire that seems to be raging within him. Unfortunately, before they can do anything to help Leifer, Bayern goes to war with its neighbor Tira. Leifer becomes a soldier and on the battlefield he wields his power with courage and skill. He serves his country with honor until the fire ends up consuming and killing him. Enna, unable to control her curiosity, reads the vellum which taught Leifer how to seek the fire. It is not long before she too is a fire talker and she soon understands why Leifer changed so much after he found the power to wield fire. Having the fire within her, and wanting to burn, takes over Enna’s life. Needing an outlet for her hunger Enna decides to work as a secret saboteur against Tiran military targets. Attacking at night, she sneaks up on their camps and sets their tents on fire. She is determined that she, unlike her brother, will not burn people, but then one night, to save herself from capture, she is forced to burn a man. When Enna is captured by the Tirans everything gets much worse. Enna is terrified that they might try to force her to teach them how to burn. At the same time the Tirans keep a tight hold on Enna by drugging her so that she cannot use her power on them and harm them. When no attempt is made to rescue her, Enna feel forsaken by Bayern. Will she ever be free from her captors? Will she ever be free from the raging need to burn? 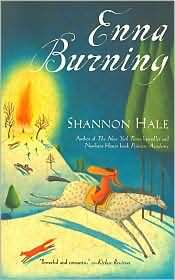 In this incredibly powerful story Shannon Hale returns to some of the characters which she brought to life in “The Goose Girl.” At times rather dark and even disturbing, this is a story which explores a girl’s journey of self discovery. Enna is forced to experience great loss and grief. She tries to gain control of her life through the power of fire, only to find that the fire is controlling her. In the end courage, love, and friendship prevail, giving Enna and Isi the peace they so desperately need. Beautifully crafted and written, this is a book which readers will remember long after they have read the last page.